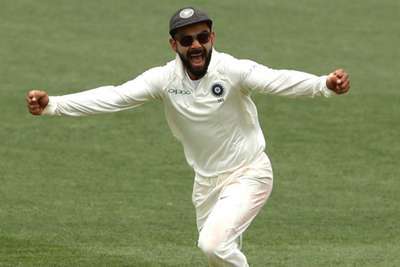 Captain Virat Kohli said India were the better team and deserved to win after the tourists a dramatic finish to defeat a gallant Australia in the first Test in Adelaide. India withstood a nervy finale at Adelaide Oval, where Kohli's men prevailed by just 31 runs as the visitors won the opening Test of a campaign on Australia soil for the first time on Monday. Australia needed a record fourth-innings run chase to claim victory and despite falling to 156-6 and 235-9 in pursuit of 323, the home side came within a whisker of achieving the improbable before Josh Hazlewood was dismissed with the final ball before tea. Tension was building prior to Ravichandran Ashwin's match-clinching breakthrough – Kohli visibly agitated as India's search for an historic win was thwarted by an inspiring rearguard display from Australia. Kohli, however, insisted India were the superior outfit as the series heads to Perth for the second Test, starting Friday. "It's important to stay calm. The odds were stacked up against them as soon as we got Pat Cummins out," Kohli said during the post-match presentation. "I wouldn't say I was cool as ice but you try not to show it. It was just a matter of one mistake or one good ball. Super proud to have four bowlers and take 20 wickets to win this Test match. It's up to our batsmen to step up in this series. Pujara and Rahane stood up in this match. "I thought we were the better team and deserved to win. I think when they bat together like that they are our most solid pair. I think it took a lot of grit and determination to put us past Australia. "I think our middle order and lower order could've done better. These things are things to keep in mind for Perth. But if you had given me 1-0 up after the first game I would've taken that." Cheteshwar Pujara was named man of the match after his 123-run display in the first innings, which he followed up with 71 in the second. "I think playing here before has helped me a lot," Pujara added. "I think what has helped me is the preparation. Ultimately winning the Test match credit to all the bowlers. "The first innings lead of 15 gave us the belief batting in the second innings. I always back my ability and I've got enough experience."